Here at Wufoo central, we subscribe to [Kathy Sierra’s school of thought](http://headrush.typepad.com/creating_passionate_users/2006/08/why_marketing_s.html) on making our documentation and manuals just as great for our existing users as the marketing materials we create for our potential users. 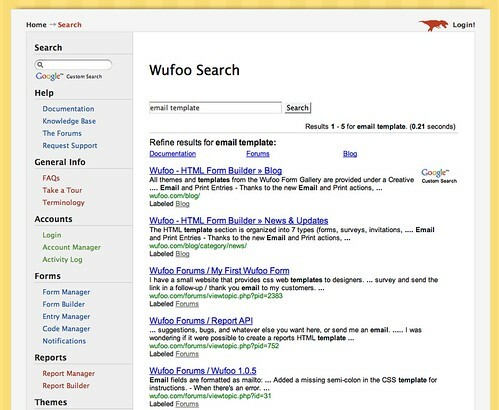 And so in our never-ending quest to create some of the best documentation out there, we’d like to show off some great improvements and additions to the organization and structure of our support docs since [our last major update last year](http://www.wufoo.com/2007/01/30/new-documentation/). 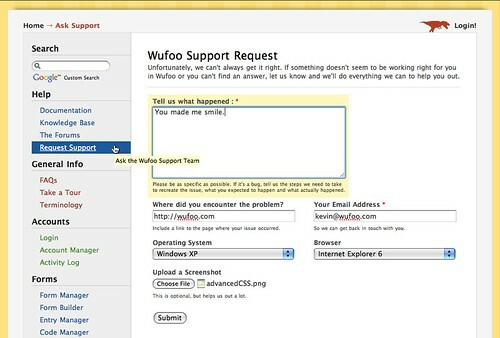 The new support page features clearly defined action items for getting help and a collection of the most frequently asked questions about Wufoo organized by application category. 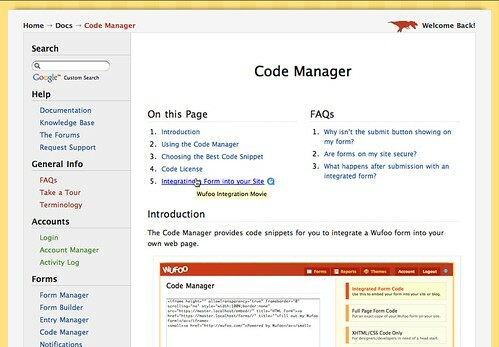 The individual documentation pages now present an individualized table of contents and a mini FAQ about features and actions for that aspect of Wufoo. These pages have also been designed to be more scannable with more illustrations, screenshots and even movies where necessary. It was time to upgrade our old bug tracker and provide a more structured support request system so we can better track and assign your inquiries internally. And yes, that’s just a good ol’ Wufoo form. 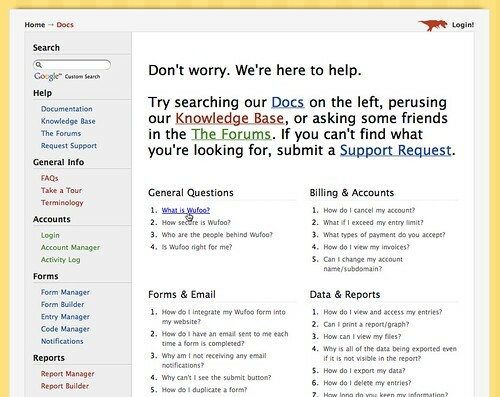 Sometimes the best way to help our users is to provide the tools needed to help themselves. With a little help from Google Custom Search, you can now get better and faster search results from information contained in our support documentation and forums. Excellent works guys. I can now see why you’ve been so busy. Lots of foundation improvements and keeping the customer central to the service!! Now all I need is the purpose to make time to learn your product all over again, and have fun. Now, that’s an incentive!! Posted February 19th, 2008 by Duncan Cunningham.